They sure don’t make ’em like they used to—and when it comes to faucets, it’s a good thing. In the old days, repairing a leaky faucet could be as simple as replacing a rubber washer, but more likely it involved struggling with corroded screws and stripped valve stems. 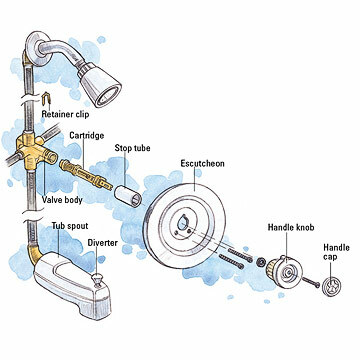 New faucets are easy to take apart, and replacement parts are readily available at most hardware stores, home centers and plumbing supply stores. Of course, there are still many different brands and styles, so it’s best to shut the water off, disassemble the faucet, and take the parts along to assure a perfect match. 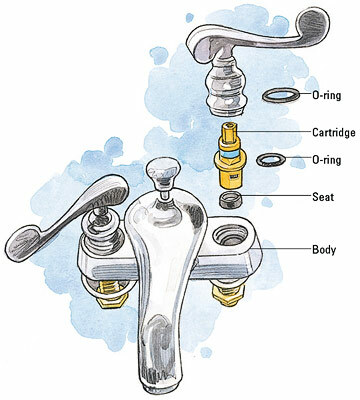 If your faucet leaks from the spout, replace the seats and springs . If it continues to drip from the spout after replacing the seats and springs, replace the cartridge, too. If your faucet leaks around the handles, the O-rings on the cartridge are bad. Buy a new kit that includes a new cartridge and O-rings. Kits containing faucet repair parts are readily available at hardware stores and home centers. We spent $3 for a set of seats and springs that fit both Delta and Peerless faucets. You’ll also need a small tube of plumber’s grease . Leaks usually develop on the hot side, but replace the seats on both hot and cold sides while you’re at it. First, turn off the water supply at the shutoff valves. Then, use the tip of a screwdriver to pry off the index cap on the top of the faucet. Once it's off, remove the handle screw underneath the cap. Remove the faucet handle by lifting it up and then tilting it backwards slightly. Remove the threaded retaining ring with slip joint pliers. Remove any retaining clip holding the cartridge in place. Grip the top of the cartridge with the pliers. Pull straight up to remove the cartridge. Install the replacement cartridge so that the tab on the new cartridge faces forward. To expose the O-rings, remove the spout by pulling it up and twisting slightly. Cut off the old O-rings with a utility knife. Coat the new O-rings with heatproof grease and install them. Reattach the spout. Screw the retaining ring onto the faucet, and tighten the ring with the slip-joint pliers. Attach the handle, the handle screw and the index cap. Turn the water back on.